Tejpal Inspires > Blog > Intuition > Renew: 5 Doorways To Access The Power Of Your Intuition. You have three minds: the negative mind, the positive mind and the neutral mind. The first one to process any information is always the negative mind. The negative mind analyzes information faster than the speed of light and jumps into assumptions. The positive mind loves to dream and to open up to many possibilities, and the neutral mind assesses the depth of your experience. When our mind is clogged, there is no room for the neutral mind. Therefore we create fear, delusion and prophecies. Our power is missed placed and we are disconnected from our soul and our truth. When our soul feeds our mind, there is no fear, no threat, and our intuition can be expressed freely. Choose to create space in every area of your life to break the patterns of your mind and explore these five dimensions. 1- At the physical level, it will support your well-being and vitality. 2- At the emotional level, it will allow you to be more detached and less in control. It will help you see your role in any relationship and dramatically enhance your listening skills. 3- At the mental level, it will support your creativity. 4- At the heart level, it will allow you to experience no agenda, no demand, no judgment and to deeply appreciate that love is space. 5- At the spiritual level, it will help you to be in tune with your intuition and to connect to your soul mission. Choose to be spacious without being spacey. 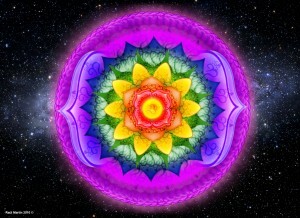 Choose to be spacious and vibrant to access the power of your intuition.